Sky-Watcher offers simple solutions for users who would like to attach their smaller telescope to a convenient computerized system but do not wish to deal with the weight of the HEQ5 or EQ6 mount. The EQ3 SynScan mounts use the same Go-To system found in the HEQ5 and EQ6 Pros-- SynScan. It allows you to point the telescope at a specific object or even tour the skies at the touch of a button. 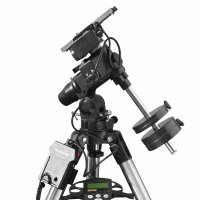 The EQ3 SynScan mounts are the perfect instrument for novice visual observers to enjoy astronomy with minimal setup time and in-depth knowledge of the night sky.